Bank House has a long and varied history. It was originally built as a Hydro, and was run by Henry Ward, see the following Census links: 1871, 1881, 1891, 1901 At some stage Bank House changed its name to Wyvern House Hydro. 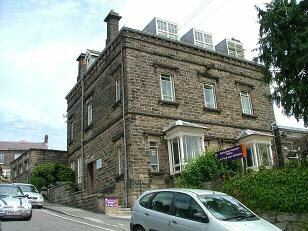 In 1924 the building became a mixed grammar school named after Ernest Henry Bailey who ran a Flour Mill in Lumsdale, see the Census links: 1871, 1881, 1891, 1901. The school closed in 1982, after merging with another school and moving to Chesterfield Road. Most local children today eventually attend the new comprehensive school, but there are fond memories of Wyvern House Hydro, which became the Ernest Bailey grammar school. Ernest Bailey, benefactor, had many mills. One day he moved out of his home and 34 boys moved in. Over almost 40 years, 450 of 'Bailey's Boys', waifs and strays, were fed, clothed and educated, many eventually finding work in his mills. The house carried on as a children's home; nursery nurses came to train there and were a familiar sight with their huge prams and tiny charges. Shortly after the building changed its purpose yet again, and became the well-known Derbyshire County Record Office (see the colour photo). The old gymnasium has been converted for storage and now holds several miles of shelved records. 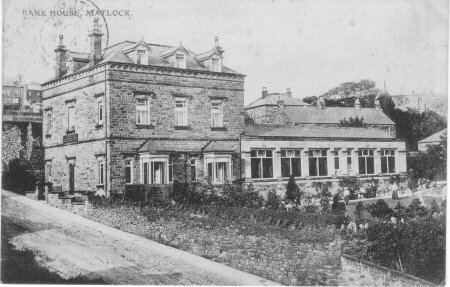 The croquet lawn in the 1907 photo has been turned into a car park for the public, access was gained by knocking a gateway through the stone wall. The low extension building on the right is now where the public studies old documents, with microfilm readers, many filing cabinets holding the film, and map tables, while members of the staff keep a watching brief.